From my earliest memories, when using brushes made by my mother from her own hair, I have loved to draw and paint and the physical, tactile quality of oil paint has always thrilled me. I grew up in a family of six in a small two bed-roomed house in the industrial midlands, and would escape for hours into the fields - lying in the long grass and drawing the heads of barley or ears of corn. At art school, I tired of being told each week to draw or paint in the style of Mondrian, Paul Klee or whichever artist our tutor had randomly selected. I needed to discover my own style and so once more I would abscond into the countryside, hiring an old barn beside a canal tow path, for my studio. It was this work and not my meagre art school presentation that won me a place at Birmingham College of Art. Whilst lecturing in the Wye Valley in Gloucestershire, I drew and painted in the hills and valleys around my home. I have always had a deep love of the sensuous quality of paint and in the late sixties began to work with painting knives. Still unsure of which way to go with my work, I was fortunate to meet John Berger, renowned art critic and writer of such books as 'Ways of Seeing' and 'Permanent Red'. He was a close friend of our local doctor who brought him along to my studio. At that time I had the first two knife paintings on easels. He stayed for several hours, talking to me about my work and his parting words were, "Alan, you have a great feel for paint and I really think the knife is the way for you to go". That was exactly what I wanted to hear. John Berger confirmed my own feelings and I have continued with the knife ever since. I believe they are more versatile than brushes and enable me to project a terrific vigour into the paintings. By varying the angle of the knife, the amount of paint I pick up and the energy with which I attack the canvas, I can depict large slats of vertical cliffs, waves crashing over jagged rocks and scudding clouds across stormy skies. Equally, the knife allows me to scrape back to the canvas, where an ebbing tide reveals smooth wet sandy beaches, with rivulets weaving their way to the sea. In the late sixties I moved to lecture in East Devon where I built the house and studio in which I still live. Here in the Otter Valley, I continued to explore and develop new techniques with painting knives, discovering that the tip can depict the tiniest seed head, whilst the edge becomes a metaphor for a stalk of barley. 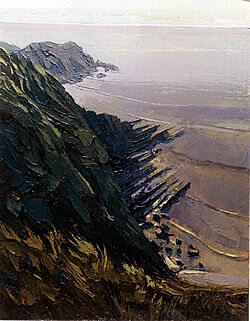 The North Devon Coastline at Hartland provided wonderful starting points for my work. On the West Coast of Ireland it is often the skies that inspire me. Here, the clouds scud in from the Atlantic, sometimes heavy and rain laden - many of my working drawings are spattered with rain and we spend many hours chasing the light. Then the sun breaks through, the landscape is flooded with a brilliant citric light and it's just magical. Once I had resigned from lecturing to paint full-time I had more freedom to travel further afield. I had visited Provence briefly as a student, trekking to the foot of Mont St Victoire where Cezanne had his studio and then to Arles and St Remy de Provence, searching for the very spots where Van Gogh had set up his easel. It may be that the ghosts of my heroes inhibited me, but I did not feel inspired to paint in these areas. It was not until years later, arriving towards sunset at the hilltop village of Gordes, with its renaissance chateau drenched in golden light that I discovered my own Provence. I have returned many times to Gordes and to the numerous hill towns of the Luberon - drawing amongst the olive groves and the cherry orchards, or looking across the Durrance Valley from Lacoste to the spire topped village of Bonnieux. As well as painting, I was by this time researching and presenting arts films for both BBC Television and ITV and it was whilst making a film on the Newlyn Artists of Cornwall that a chance meeting with David Messum of Messum's Fine Art in Cork Street, London, was to change my life. I was filming an auction, where David was bidding for a Thomas Cooper-Gotch painting. He already knew my work and said he had been about to approach me, to exhibit with the gallery. I had my first show in 1988 and have been with them ever since, having annual exhibitions in London. David represents me internationally and has also become one of my closest friends. Many of the places I have worked have been influenced by people I have met. I was fortunate to accompany HRH The Prince of Wales as his tour artist, travelling with him to Sri Lanka, Australia, New Zealand and Fiji. The Royal Albatross Centre, near Dunedin, on the South Island of New Zealand, provided a rich source of inspiration for a series of paintings and in Fiji I was taken by a local driver to his village in the hills. 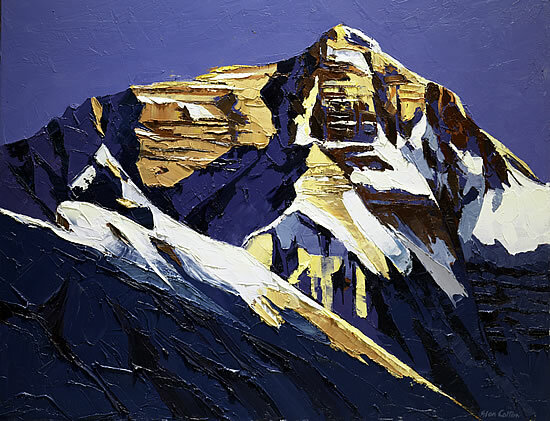 I had long wanted to travel to the Himalayas and to paint Everest. In May last year I was invited by explorer, David Hempleman-Adams to join him as expedition artist, as he led a party attempting to reach the summit of the world's highest mountain, via the North Face. David and three others succeeded, but whilst I was just one day away from Base Camp, travelling with my son Robin, our trip was thwarted by the Chinese Police, following a demonstration by American students on the 60th anniversary of the Chinese invasion of Tibet. 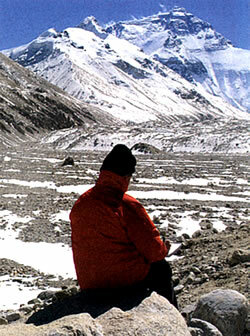 As a result, the route to Everest was closed and foreigners told to leave Tibet. I returned again in October with David and this time we had a most successful trip, with clear skies and brilliant light. We reached Base Camp and climbed even higher. I did around forty drawings from which I have completed a series of twenty-five paintings for my forthcoming London exhibition at Messum's, opening on 12th September 2012. Many of my paintings are done at either end of the day, particularly in late evening light when there are dramatic possibilities and contrast of light and shade. At heart, I am a romantic and never happier than when walking in fields or along a cliff top. On the West Coast of Ireland the images are of the most simple kind - stone walls, lanes leading down to estuaries, field enclosures and headlands. Even though I frequently have to dodge the downpours, I have probably done more drawing in Co Kerry and Donegal than in any other region. Mostly, I love to paint looking into light, where there are strong tonal and colour contrasts and the foreground is silhouetted against the sky. 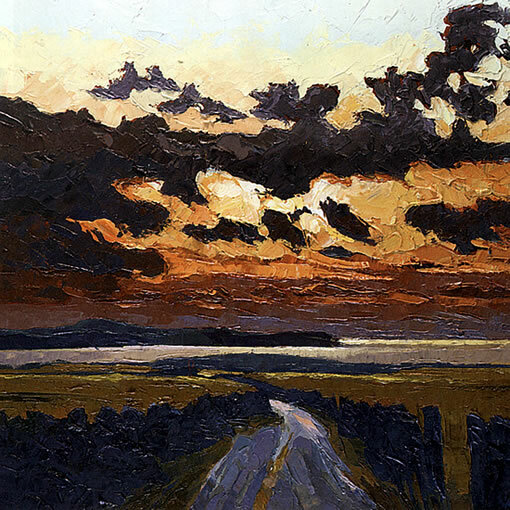 In many of my Irish paintings there is often just a narrow strip of land at the bottom and the remainder is filled with wild cloud formations billowing in off the Atlantic. This dramatic canvas was painted after a very stormy day. The sky had been leaden and though I had made several attempts in my sketchbook, there had been little to inspire me. Then towards evening the heavy storm clouds began to roll away and the setting sun broke through, creating a powerful image of great drama. 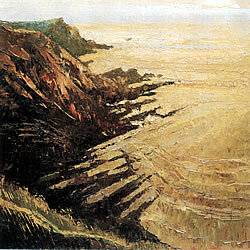 This small painting is of a very remote bay, difficult to reach by road. The painting knife allows me to make rectangular slats of paint, but can also scrape back to the canvas. 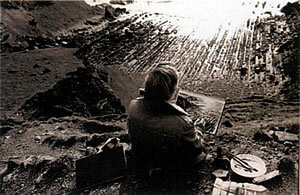 Here, painting in the evening, with the light dazzling off the sea I have used a very limited colour range. It was completed at one sitting from a series of small drawings done on a cool spring evening, sitting on top of a hill and looking across the fields and cottages to the bay. There is a particular piece of coastline at Hartland to which I return again and again - I have produced many paintings from this one spot. I go there at different times of day and in different seasons of the year and the light is never the same. Sometimes, even in a sombre painting, the light catches the waves and sparkles in lemon yellow, in another the light will pick up the deep purple crevices of the rocks which, with the sun on the water, creates a symphony in purple and gold. I carefully study the changing light at different times of day and look at the colour harmonies created along the coastal edge. This was painted from that viewpoint on a golden autumn evening when there were extreme contrasts between the setting sun reflecting on the sea and the dark shapes of the cliffs and those rocky fingers stretching into shimmering water. 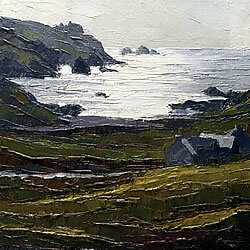 Hartland Quay, in North Devon, offered a dramatic contrast to the lush valleys of the south-eastern part of the county. When I first set eyes on the Hartland peninsula, the scene before me was breathtaking, with great cathedral-like structures of cliff face and fingers of jagged rocks, stretching out into churning seas. I started working at Hartland over 30 years ago and still when I return I am excited by the heaving mass of water, constantly pounding the sharply tilted slabs of rock, which have become the starting point for well over a hundred paintings. Hartland was important to me because it allowed me, early in my career, to discover the vast range of marks the knife can make, from broad chunks of heavy impasto on the cliff face and the rock terraces to the linear ridges of the eroded rocky outcrops. I discovered that when the paint on the roughly textured rocks was dry I could scumble wet paint across the painting, so that the waves crashed and foamed over them. I much enjoy looking along the coast line to distant horizon but then looking down the sheer cliff face, with a vertiginous viewpoint. Compositionally, this large vertical painting allows me to create this. All around the square in Marrakech are the Souks, their noisy, teaming alleyways stacked with leather goods, carpets, brass wear, clothes and jewellery. It is fascinating to be there, but impossible to draw. Behind the souks however, where darkened doorways mark the dwellings of the Berber traders and the back entrances to the frenetic activities inside, it is quiet. Here, I was able to do a number of drawings. Again, I was intrigued by the shade provided by the corrugated iron porches and the striped fabric hanging above the doorways, contrasting with relentless light of the midday son. 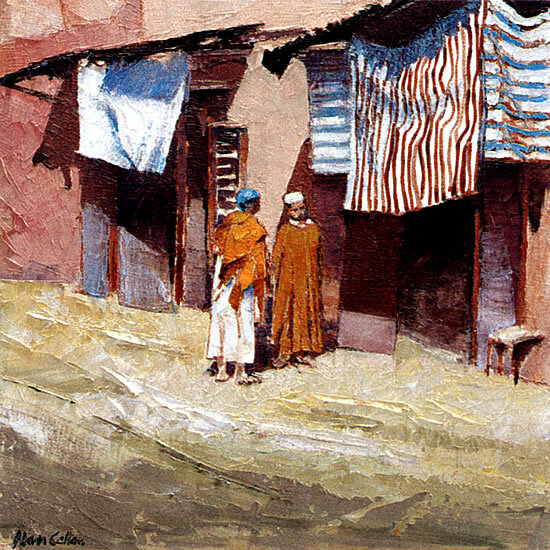 Here men would stand or sit, sometimes in the shade, but often standing in the open, their saffron garments catching the light. I probably would not have travelled to Morocco in 2001 if my friend, Art Malik, hadn't been filming out there. He phoned me from Ouarzazate on a plateau high in the Atlas Mountains and said, "You just have to get out here. The colours and light will blow your mind". Ouarzazate is noted for its massive film studios - the largest in Morocco where many international film companies come to shoot their films - Lawrence of Arabia, The Last Temptation of Christ, Gladiator and Salmon Fishing in the Yemen were amongst hundreds of films shot here. We drove up into the mountains and what deeply impressed me was seeing sequences of colour that I had never seen before. In evening light the distant peaks glowed golden. The valleys in the middle distance and the foreground were in deep shadow, yet within the darks there was a tremendous amount of colour. They were colours I hadn't used for many years and I phoned home to order the ones I knew I would need on my return - Indian Red, Van Dyke Brown, Carmine and Raw Sienna. Back in my studio I was armed with many drawings and a number of colour studies. I love the dramatic contrast of brilliant light and deep shadow, but there was a translucency of reflected light in some of the darker passages that provided quite a challenge. I started by using thin oil paint on a white canvas, almost like watercolour, where I laid down patches of colour like under painting. Then I drew the composition on to the canvas with a brush. Once this was dry, I applied the oil paint with a knife, but in some areas, particularly in the dark passages, I scraped back, so that the white of the canvas or the underlying colours would show through, which gave a transparency that I couldn't achieve with opaque pigment. 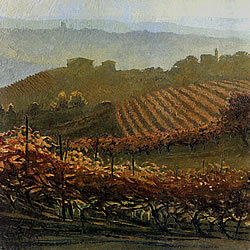 Piemonte is the wine growing region of Italy, producing the renowned Barolo and Barbaresco wines. There are probably more hill towns in this region than anywhere else I have travelled. Most of the paintings I have done are where I have been looking across the landscape towards distant hills topped with castles or churches. 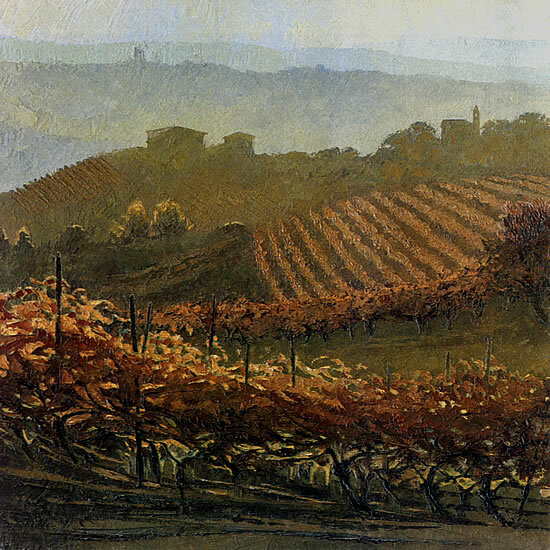 This late autumn painting shows the vineyards after the grapes have been harvested and the vine leaves are turning into magnificent ochre, golds and reds. The mists have gathered in the valleys and the distances are diffused and softened, which has allowed me to create tremendous special depth. I have used the tip of the knife, rather than the edge to tease the images into life. The challenge of focus and diffusion is something that is appreciated by many painters and this is perhaps a good example of the sharpness and clarity of the foreground, while the landscape dissolves into soft diffused forms. This classic view looking down the Grand Canal from Accademia Bridge is perhaps one of the most painted images of this unique city. 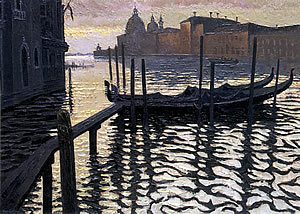 A fellow artist once said to me "Venice is a bit of a tart - every painter has had a go at her". It is true that for Canaletto, Turner, Monet, John Singer Sargent and the hundreds of other painters who have stood on this very spot, the view of S. Maria dela Salute and the Grand Canal has been very special. Although I am now more inspired by the reflections in the narrow canals, whenever I return to Venice I am still drawn back here and it is always stunning. I was up at dawn, when there was a hazy light over the canal and the sun was coming over the horizon. It is that moment when Venice is just waking up and the only canal traffic are the barges delivering produce or collecting the garbage. I have done numerous 'paintings from the Accademia Bridge, but like Monet's multiple paintings of Rouen Cathedral, the light is always different and the colours forever changing, so that every time I stand there to draw, it is new and thrilling. 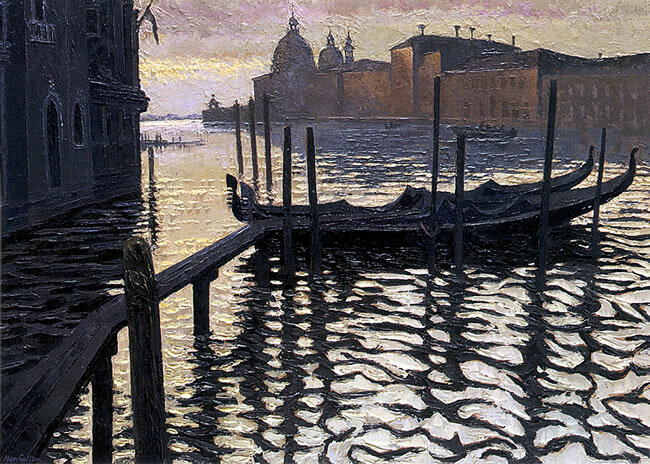 Many of the paintings I have done of Salute have a colour harmony- sometimes warm and golden, then at other times the canal is dark green, with silver light rippling on the surface. Here it was a particularly hazy morning and the distant facades took on a blueish hue, reflecting in the depths of the Grand Canal. For this painting, I set off before dawn when everywhere was deserted and in the eerie early morning light it was like travelling through a series of unlit theatre sets. I turned down a narrow alley way and found myself at a mooring stage, looking down the Grand Canal towards S. Maria dela Salute. When I began I had intended to make Salute the subject of the drawing. The sun was beginning to rise beyond the dome of the church illuminating the canal so that the mooring poles, the landing platform and gondolas in the foreground were silhouetted against dazzling water. Back in the studio, when selecting the composition from the drawing, these stark black images on the page and my memories of them against the sparkling ripples became the most important part of the painting and occupy half of the canvas. In many of my later Venice paintings I have become more interested in looking down into the water and seeing the reflections of the buildings. Sometimes, the canal is still and there is a mirror image. 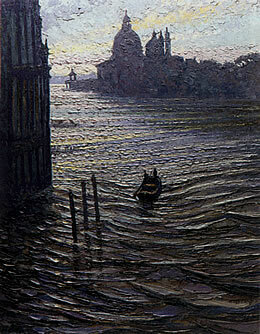 Then a barge or gondola passes by and the waters distort into swirling abstract colours and shapes. Then I must draw furiously before the moment is lost. Drawing is always the starting point and the key to my finished paintings, so that whilst some may be the briefest of sketches with working notes, others need to be more detailed so that I have all the material I need when paining back in the studio. Even though I was working in sub zero temperatures at Base Camp I needed to gather as much information as I could to convey that moment of time in the drawing. Back in the studio I then select just the elements I need for that particular painting. On some canvases much of the material I have gathered will be discarded and I work intuitively from memory and by mixing the paint on the palette. This was a much later painting in the series. By this time I had begun to simplify the amount of information that I had in my drawing. I was aiming to create a more sculptural 3D image using the overhead light to create a clear definition between the brightness of the light against the blue sky and the depth of the shadows. Here I have used the flat blade of the knife to depict the vast slabs of snow clad rocks on the sun facing mountain side, contrasted with the thickly ridged dark crevices on the shaded side of Everest. 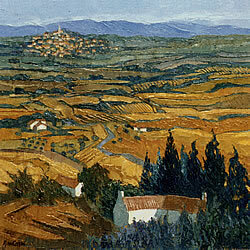 This panoramic view looking from the village of Lacoste across the Durrance Valley to Bonnieux was painted in the autumn when the fields were washed in glorious golden colours. From a high vantage point on the terraces of the hill town it allows the painter to take in the wide panoramic sweep where the fields and farm buildings become jewelled patterns. This shows how the painting knife can be used to make textural marks; the fine edge of the knife making the linear patterns of the rows of crops or lavender almost like a printed mark, whilst the point depicts the olive trees in distant orchards. This was the first painting I did when I returned from Everest. It is one of three I completed for David Hempleman-Adams in exchange for arranging and funding my two trips to Everest. He has reached the top and knows the mountain so well that I knew it had to be topographically accurate. 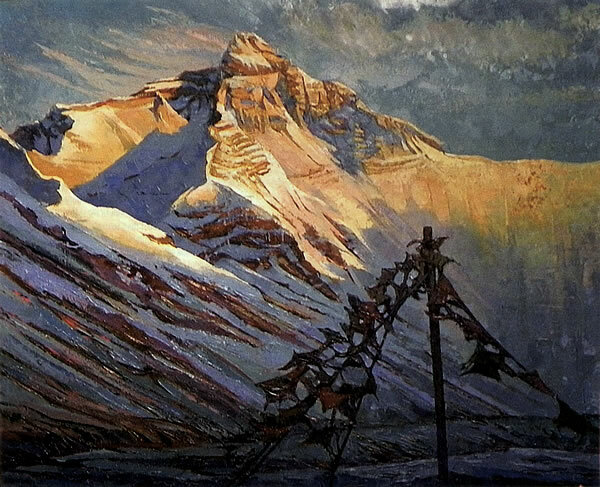 It was painted in evening light when the sun, low on the horizon, bathed the glistening slopes and the summit in golden light. The flags in the foreground are prayer flags, placed there by the Buddhist climbers. These are colourful panels of cloth containing texts and prayers. The Tibetans believe that these will be blown by the wind towards Mount Qomolangma - the ancient Tibetan name for Everest - to spread good will and compassion into all pervading space. Although the mountain was still in sunlight, I was working in deep shadow, with temperatures rapidly dropping to around 20 degrees below. Even with silk gloves under my woollen ones, my fingers were numb as I sketched furiously before the sun finally disappeared. For most of the time I was well outside my comfort zone, but travelling to Everest was the fulfilment of a long held dream, and following the bitter disappointment of that aborted first trip I couldn't wait to go back again. For as David said it was "...unfinished business". Back in the warmth of my studio, I presented the finished painting to him and we shared memories of the time we spent together at Base Camp. It pleased me much that he not only loved the painting, but was impressed by its accuracy. He pointed out to me the spots where various advanced camps had been pitched and that sheer, daunting barrier of the north face, to be overcome in order to reach the summit. 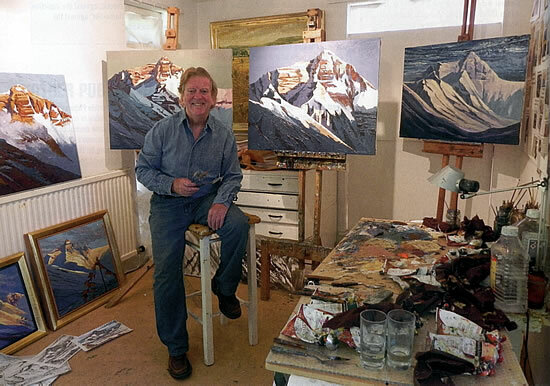 Alan was brought up in Redditch, Worcestershire, where he attended the local Grammar and Art Schools, before moving on to study at Ruskin Hall, Bournville School of Art. 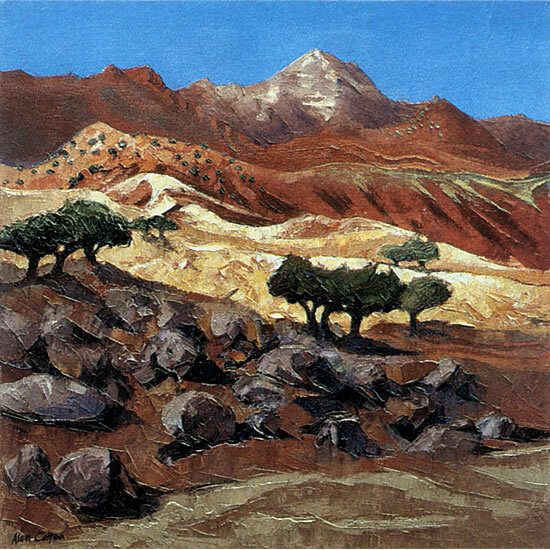 He progressed to Birmingham College of Art and after three years in the Painting School there, completed his training at Birmingham University and at the University of Exeter; where he took his Master's Degree. For some years he was in charge of Painting and Art History at Rolle College, Exmouth, until he resigned this position in 1982 to paint full time. In 2005 he was honoured to accompany His Royal Highness, The Prince of Wales, to Sri Lanka, Australia, New Zealand and Fiji as his Tour Artist. Alan has worked closely with many charities over the years. Last year he was nominated as an Icon by the Duke of Edinburgh Awards Committee and attended two fund raising dinners at Windsor Castle, together with many celebrities. Alan is a founding member and the first President of the South West Academy of Fine and Applied Arts, which encourages and supports young artists. In 2006 he was awarded an Honorary Doctorate (D.Litt) by the University of Exeter for his 'outstanding contribution to the Arts'. "The Benefits of the Blade"